When people in a specific area are more than ten times more likely to live to 100 than those who live elsewhere, odds are they're onto something. And renowned explorer Dan Buettner was determined to find them, and learn their healthy-living secrets. 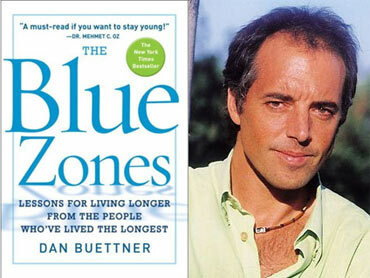 He dubbed the longevity hotspots "blue zones," and started an ongoing project of the same name. Buettner, the National Geographic Society and a team of scientists identify and study the regions and their common threads regarding lifestyle, behavior, diet, outlook and stress-coping mechanisms. The idea is to help other people live longer, healthier, happier lives. Buettner visited "The Early Show Saturday Edition" as part of its special broadcast, "Secrets for a Longer Life." He also . In those far-flung parts of the world, people manage to avoid many of the diseases that kill Americans. On the broadcast, Buettner explained to subsitute co-anchor Debbye Turner Bell that blue zones are "demographically-confirmed and geographically-defined, and they're entire populations of people, pockets around the world where people are living as much as a decade longer than we are." Buettner told CBS News there's no one key to longevity. "There is nothing that can stop, reverse or even slow aging," he says, "but there are several small things we can do to raise our life expectancy of the average American by about 12 years." Among them: Avoid hard-pounding exercise in favor of low-impact, enjoyable physical activity, surround yourself with the right kind of people. Avoid meat and eat nuts. Lean plant-based diet accented with meat - Diet consists of whole grain bread, beans, garden vegetables and fruits. Sardinians traditionally eat pecorino cheese made from grass fed sheep which is high in Omega 3's. Meat only on special occasions or Sunday. Family First - Strong family values. Every member of the family is cared for reducing risk of depression, suicide and stress. Goat's Milk - Protects against inflammatory disease of aging such as heart disease and Alzheimer's. Celebrate Elders - Grandparents provide love, childcare, financial support, motivation and expectations. This may add up to healthier, better adjusted children. Walking - Walking 5 miles per day provides cardiovascular benefits plus positive effects on bone and muscle metabolism without joint-pounding. Drink a glass or two of red wine daily - Cannonau wine has two to three times the level of artery-scrubbing flavonoids as other wines. Laughter - Literally, their sardonic humor reduces stress. For more see Page 2. World's longest-lived women are here. Moai(s) are small social networks wherein members commit for life to support each other. We know that isolation kills and it's an increasing problem in this country. They eat a plant-based diet favoring goya and tofu, and very little fish. Embrace of Ikigai - Purpose-imbued lives gives them clear role of responsibility and feelings of being needed well into their 100s. Rely on a Plant-Based Diet - Stir fried vegetables, sweet potatoes and tofu are high in nutrients, low in calories. Goya lowers the blood sugar. Gardening - A source of daily physical activity with a wide range of motion and helps reduce stress. Soy - A diet rich in soy (miso and tofu) contains flavonoids that protect the heart and guard against breast cancer. Fermented soy is both nutritional and good for the intestines. Maintain a moai - The tradition of forming a moai provides secure social networks. The network lends financial and emotional support in times of need and gives all members stress-shedding security of knowing there is always someone there for them. Sunshine - Vitamin D produced by the body when exposed to sunlight promotes stronger bones and healthier bodies. Okinawans have the optimal level. Stay active - Active walkers and gardeners. Sparse furnishings with meals taken sitting on tatami mats. Even the oldest get up and down everyday which builds lower body strength and balance. Medicinal Garden - Mugwort, Ginger and Turmeric are all staples of an Okinawan Garden and are consumed everyday. Attitude - Learn to shed difficult early years and remain likeable to young people. In antiquity, Ikaria was known as a health destination, largely for its radioactive hot springs, which were believed to relieve pain and to cure joint problems and skin ailments. But for much of the ensuing two millennia, civilization passed over this wind-beaten, harbor-less island. To elude marauding pirates, Ikarians moved their villages inland, high up on the rocky slopes. Their isolation led to a unique lifestyle. Over centuries with no outside influences, island natives developed a distinctive outlook on life, including relentless optimism and a propensity for partying, both of which reduce stress. Ikarians go to bed well after midnight, sleep late, and take daily naps. Based on our interviews, we have reason to believe that most Ikarians over 90 are sexually active. Ikarian villages are ghost towns during the afternoon siesta, and science shows that a regular 30-minute nap decreases the risk of heart attack. Take a Nap - Taking a nap 5x a week for ½ hour reduces risk of cardiovascular disease by 25%. Honey - Ikarian Honey possesses compounds that kill cancer cells and have powerful probiotics. Tea in Ikaria - Lowers risk of cardiovascular disease - teas are diuretics which lower blood pressure. Teas are Sage, Rosemary, Olive leaf. On the whole, Blue Zone centenarians have suffered some poverty, which has probably helped nudge them into behaviors that favor longevity (e.g. plant-based diet, little overeating, a reliance on religion, high physical activity, reliance on social networks). Ironically, Costa Rica has arguably BETTER public health than America does - certainly better for poor people. A plan de vida - A strong sense of purpose. They feel needed and want to contribute to a greater good. Drink Hard Water - Very high calcium content in water may explain lower rates of heart disease, stronger bones and fewer incidents of hip fractures. Keep focus on family - Sense of purpose and belonging. Eat a light Dinner - Eating fewer calories is the surest way to add years to your life. Maintain Social Networks - Frequent visits from neighbors. Maintain Hard Work - Finding joy in everyday physical chores. Loma Linda is a town with a large population of Seventh Day Adventists. The largest meal of the day is breakfast and the meals get smaller throughout the day. Studies show that eating a healthy breakfast can help give you a more nutritionally complete diet and is higher in nutrients, vitamins and minerals; improves concentration and performance in the classroom or the boardroom; offers more strength and endurance to engage in physical activity; and lowers cholesterol levels. Find Sanctuary in time - 24-hour Sabbath provides a time to focus on family, camaraderie, nature and God. Maintain a healthy BMI - Eating less meat leads to lower blood pressure, low blood cholesterol and less cardiovascular disease. Regular moderate exercise - Daily walks reduce the risk of heart disease and cancer. Spend time with like-minded friends - Shared values and mutual support. Snack on Nuts - Those who consumed nuts at least 5 times a week had half the risk of heart disease and live about two years longer. Give Something Back - Stay active, gives sense of purpose and staves of depression. Eat meat in moderation - Consuming fruits, veggies and whole grains protect against a wide variety of cancer. Eat an early light dinner - Eat breakfast like a king, lunch like a prince and dinner like a pauper. Put more plants in your diet - Nonsmoking Adventists who ate 2 or more servings of fruit per day had about 70% fewer lung cancers than nonsmokers who ate fruit less than twice a week. Those who ate legumes 3 times a week had a 30-40 percent reduction in colon cancer. Adventist women who consumed tomatoes at least 3 or 4 times a week reduced their chance of getting ovarian cancer by 70 percent per week. Drink Plenty of Water - Men who drank 5 or 6 daily glasses of water had a substantial risk of fatal heart attack - 60-70 percent less compared to those who drank considerably less.